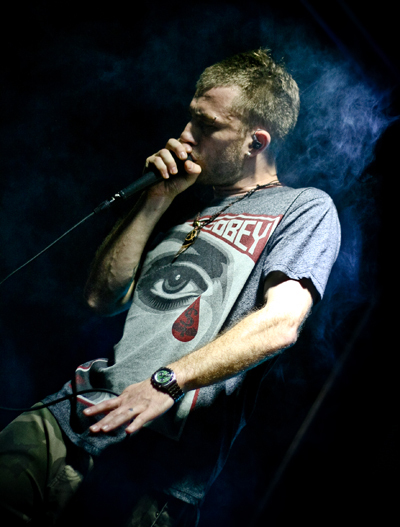 DUB FX (Benjamin Stanford) is a worldwide street performer and studio recording artist from St Kilda, Melbourne, Australia. His trademark is creating rich live music using only his voice aided by live looping and effect pedals. Dub’s music really gained momentum when Bristol film maker BD filmed “Love Someone” on the street and posted it on his YouTube account. 30 million collective views later Dub has travelled to all far reaches off the globe to perform with his fiancée Flower Fairy. Dub has several releases out, “Live in the Street” a collection of street performances from his travels busking through Europe in his van, a remastered double album “Everythinks A Ripple/RMX” which combines his first studio album repackaged with a remix album showcasing various producers. Dub is also heavily into production and teamed up with long-time friend SIRIUS to release "A Crossworlds" a very mature Dubstep Album and Flower Fairy’s album “Nursery Gryme”.